It’s amazing how much bad policy gets enacted in the name of the children. For example, illegal immigrants and drug felons currently can collect welfare checks in Texas, even though they are theoretically prevented from doing so. How does this happen? They collect welfare in the name of their children. In my time as a Texas Workforce Commissioner, issues have cropped up directly or indirectly in the course of my duties that shout out for reform. 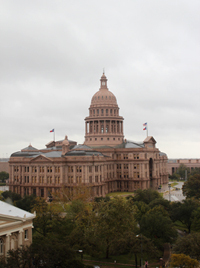 For example, fixing the loopholes that allow illegal immigrants and drug felons to collect welfare benefits in Texas should be a part of a reform legislative agenda in 2013. By law, illegal immigrants cannot collect Temporary Aid to Needy Families (TANF). But a child born to illegal immigrants is a U.S. citizen. Current law allows the parents to apply for welfare in the name of their children and be in control of the money doled out by the government. Here’s what’s really nuts about this policy. Normally, any adult TANF recipient must participate in the state’s work program. The key word in TANF is Temporary. That program is designed as a short-term bridge to work. However, an illegal immigrant is ineligible for employment in the United States. So illegal immigrants can get welfare for their kids and not participate in our work programs. In fact, the time limits the state applies to other recipients don’t even apply to those collecting solely for their children. Similarly, people who commit drug felonies may receive cash on behalf of their children, though they may not receive it for themselves. And, they are free to spend it in any way they see fit. We don’t need to be subsidizing drug addicts’ habits. It’s time to prohibit illegal immigrants from collecting welfare on behalf of children, or at least put a time limit on it. Further, let’s prohibit drug felons from collecting welfare on behalf of their children. There are better ways to benefit needy children. Another nonsensical policy is one that prohibits drug testing for people on unemployment insurance. In many jobs, it’s standard operating procedure to require drug testing before hiring and at random intervals thereafter. Someone abusing illegal drugs is a liability in the workplace. Yet, a person can collect Unemployment Insurance even though their drug habit makes it unlikely that they could re-enter their profession. There is a common-sense solution to this problem. If a worker were laid off from an industry or firm where drug-testing was commonplace, they should have to take a drug test to continue to receive unemployment benefits. Public benefits should be a temporary help to people actively trying to find work. I’m glad to see that Senator Jane Nelson has filed Senate Bill 11, which makes many needed changes – including time limits – to the Texas TANF program. I would encourage lawmakers to consider some of the taxpayer-friendly proposals above in addition to the excellent ideas in that bill. Another form of welfare is the state’s contracting preferences for Historically Underutilized Businesses or HUBs. (This is a euphemism for minority- or woman-owned businesses.) Why should someone born in Sri Lanka or Pakistan get state contracting preferences over a native Texan who happened to be born as a white male of European descent? The state should get the best deal, not give out corporate welfare on the basis of ethnicity or gender. Texas has made substantial progress curbing abuses in welfare and creating a culture that rewards work. Let’s apply these common-sense reforms to those who are welfare beneficiaries so that our state continues to encourage work and provides a level playing field for all Texans seeking to do business with the state.